This summer marks the 700th anniversary of the consecration of St Andrews Cathedral in Fife. During the Middle Ages, St Andrews Cathedral was the largest and most important church in Scotland. The Cathedral was officially consecrated, or blessed, on 5 July 1318, in the presence of King Robert the Bruce. This occasion in many ways acted as the Cathedral’s ‘opening ceremony’, and was a great national event attended by seven bishops and the leading nobles of Scotland. To commemorate this major anniversary in the history of St Andrews and Scotland there will be a series of events held in June and July 2018. 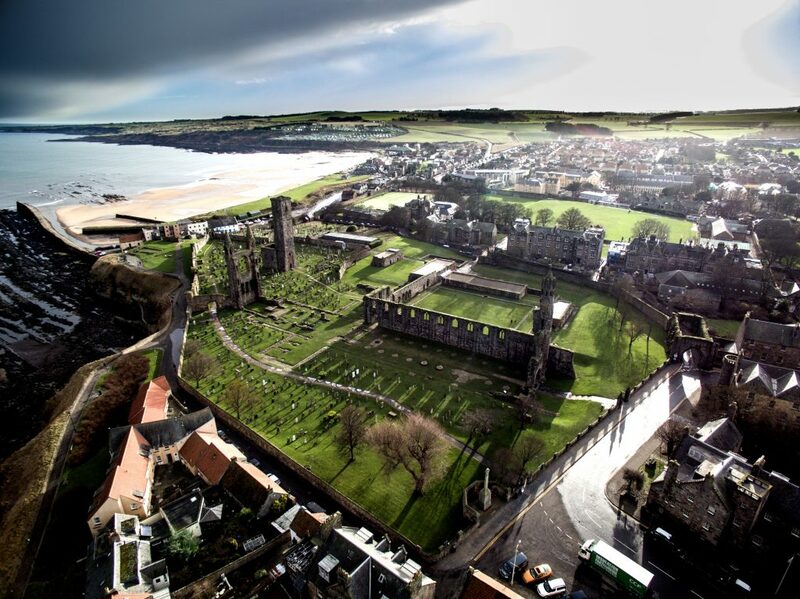 Aerial View of St Andrews Cathedral (Open Virtual Worlds, University of St Andrews). ‘The Story of St Andrews Cathedral’ – 700th Anniversary Historical Pageant. University of St Andrews Thanksgiving Service – Including Commemoration of the 700th Anniversary of St Andrews Cathedral. 11am, St Salvator’s Chapel, St Andrews. ‘An Exceptional and Prestigious Church’ – A Walk Celebrating 700 Years of St Andrews Cathedral, led by Dr Bess Rhodes in collaboration with Fife Pilgrim Way. 2pm to 4pm. Walk begins in front of St Andrews Museum, Kinburn Park, St Andrews. Show and Tell of Manuscripts Associated with St Andrews Cathedral – Public Event by University of St Andrews Library’s Special Collections Division. 2pm, Special Collections Napier Reading Room, Martyrs Kirk, St Andrews. Pilgrimage in Honour of Our Lady and St Andrew, Commemorating the 700th Anniversary of the Consecration of St Andrews Cathedral – Organised by New Dawn Conference. Procession gathers at 10.45am at St James’s Church, and proceeds to St Andrews Cathedral, where an Open Air Mass will be celebrated at 11.30am. Service to Commemorate the 700th Anniversary of St Andrews Cathedral – Organised by All Saints Church. 3pm in St Andrews Cathedral. St Andrews Cathedral 700th Anniversary Afternoon Tea. 3pm in the MacAllan Boardroom at Hotel du Vin, 40 The Scores, St Andrews. Full afternoon tea is a special rate of £18.50 (including savoury and sweet items, and candy-floss). To book call 01334 845 148. Cathedral Questions – Discover the History of St Andrews Cathedral. 12pm to 4pm in the Visit Scotland Information Centre, Market Street, St Andrews. Act of Remembrance and Sung Eucharist – Organised by All Saints Church. Remembrance begins 9.40am at St Andrews Cathedral, and is followed by a sung service at 10am at All Saints Church, St Andrews. Exhibit on the Consecration of St Andrews Cathedral. Digital Reconstruction of St Andrews Cathedral, c.1318. 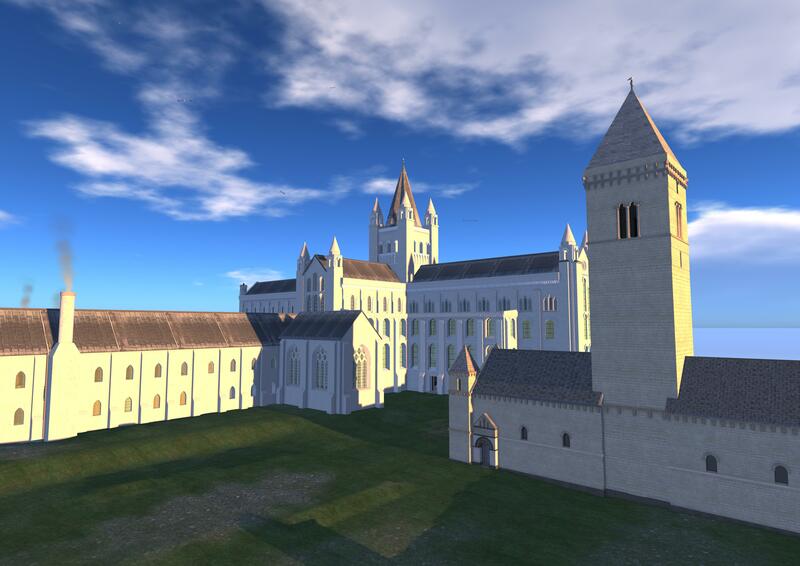 Reconstruction of St Andrews Cathedral, c.1318 (Open Virtual Worlds, University of St Andrews).